Tyrone Guthrie was born in Tunbridge Wells, Kent, on 2 July 1900 but came to live in his parental home at Annaghmakerrig, Newbliss, County Monaghan when he was six months old. 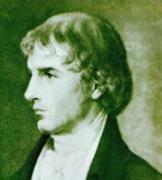 He was educated at Wellington College and St John's College, Oxford. In 1923 he was invited to join the Oxford Playhouse, which had such notable players as John Gielgud, Richard Goolden and Flora Robson. However after a short time he left to join the BBC in Belfast, where, on 15 September 1924 his was the first voice heard on the new service - then call 2BE. Guthrie became director of the Scottish National Theatre Society in Glasgow for two years. He worked with the BBC in London and with the Canadian Broadcasting Corporation, as well as with the Festival Theatre, Cambridge, and the Westminster Theatre, London. In 1931 he directed plays for Sadler's Wells and the Old Vic, where in 1933 he introduced Laurence Olivier as Hamlet. He became director of the latter in 1951. Many of his productions were staged in Australia, England, America, Finland and Israel, and he became first director of the Old Minnesota Classical Theatre in Minneapolis. He was given honorary degrees by Queen's University, Belfast; Trinity College, Dublin; St. Andrews; Franklyn and Marshall University (Pennsylvania); Western Ontario; Ripon College (Wisconsin) and Citidel Military College, Charleston. From 1963 to 1970 he served as Chancellor of Queen's University. He was also Chairman of the Ulster Theatre Council and in 1961 was knighted for his service to the theatre. Among his publications are Theatre Prospect; Top of the Ladder; In Several Directions and A Life in the Theatre. In 1962 he established a jam factory in Newbliss, in an attempt to alleviate high unemployment. It went into liquidation the year that he died. He died on 15 May 1971 in Annaghmakerrig House, and in his will left his house to the Irish government as a retreat for artists and writers.